Laying on the hard floor, exhausted, we couldn’t fall asleep. After 10 minutes my shoulder was hurting and I knew it was going to be a long night. All of the sudden, Dan jumps up and exclaims the neighbors are here! He rushes outside to catch them before they go in. I let the dogs out and join him. Pretty soon we are having beers, and Baxter and Lucy are chasing their cat around. Turns out, they love dogs. Phil and Simone are younger than us, maybe mid 30’s, he’s tall and wiry she’s cute with long brown hair. They tell us about the neighbor who used to live here; “the crazy chicken lady. She had around 100 chickens and would butcher them in the kitchen and sell the meat and eggs. Chickens running all over the yard, chicken poop everywhere. Strange because you’d never know it, the place looks clean and there are no smells. They have the boxes Brian shipped and they have a blow up mattress we can borrow, plus, Simone throws in a roll of toilet paper. Thankful for our great new neighbors, we go home, blow up the air mattress, and fall fast asleep. Lucy relaxing on the blow up bed. The sun has risen pretty high by the time we get up, it’s around 8:30. We’ve got a busy day ahead of us. 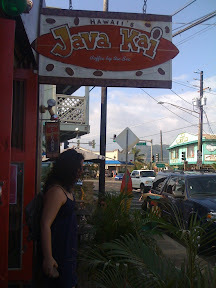 After breakfast at the local coffee joint, Java Kai, we get a mattress and bed frame. 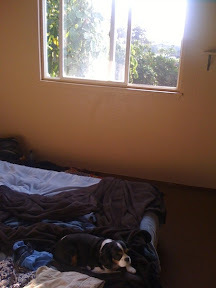 We will pick up the mattress later in the day, the frame will be delivered Monday. 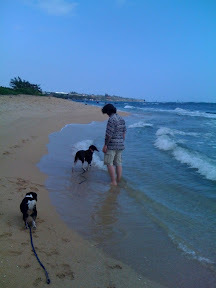 We make a quick stop, it’s Baxter and Lucy’s first time at the ocean. Baxter, quivering with excitement, jumps right in and takes a big drink. His face says it all, yuck! He can’t help himself and does it two more times, finally deciding to get out of the water figuring if you can’t drink it, what good is it? Lucy got her feet wet but basically stayed in the sand. The day was productive, besides the mattress and frame we got a TV (yes, a TV, we wanted to be able to chill at night, there is no deck to sit on outside so, inside it is), trash cans, grocery’s and a really cute outdoor patio set for our dining room table. I’ll post pictures tomorrow, I’m not totally set up yet. Exhausted and tired of ABC (the only channel we can get right now) we got to bed at 8!